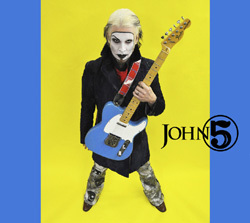 John 5 is best known for his work as former guitarist for Marilyn Manson and also as guitarist for Rob Zombie. He has one of the most impressive resumes in rock having working with artists like, K.D Lang, Lita Ford, Meatloaf, David Lee Roth, Salt-N-Pepa, and Lynyrd Skynyrd. His latest solo effort is titled “The Art of Malice.” I sat down with him recently to talk music and what he would most like to do otherwise. Maximum Ink: If you dont mind asking, how did the stage name John 5 come about? John 5: I became John 5 when I joined Marilyn Manson. He dubbed me that because I was the 5th member to join the group, and yeah, it does have a biblical reference too. MI: You profess to have an ardent love of Bluegrass. Can you tell us a little about that and why you love it so much? J5: The reason I love it is it s a different style of playing guitar all together. I enjoy playing different styles. It keeps me entertained and isn’t the same thing over & over.It’s a lot of fun playing country and bluegrass. Chicken picking, banjo rules, double stops, and nice country bends. It’s all very different from rock. The style of playing is fun to experiment with. MI: “Sugar Foot Rag” from your 2004 solo album “Vertigo” showcases the influence Bluegrass has had on your style.Would you ever play on a Bluegrass album? J5: I would love to play on a bluegrass album.I don’t know if I’ll be playing rock at a super old age. It depends how long people want me to play rock music & will accept me. Later on in life I would love to play with Bluegrass or Country groups.l love music, doesn’t matter what it is, as long as I have a guitar around me. MI: Which other genres of music are your favorites? J5: Rock is my favorite.Country. I love the playing and lyrics of old country. Also there is some new country I enjoy. Zack Brown Band is one. MI: What is it like to get to work with some of the biggest names in the music industry? J5: I had dreams when I was a child and never even thought I’d get to work with any of my heroes. At most I dreamed of getting to meet them one day. So my dreams went far and beyond what I ever envisioned.No words can describe what has happened in my life and the people I’ve worked with. I’m in awe and so thankful for it and appreciate what I have. MI: Which of the artists you have worked with have you learned the most from? J5: I’m like a sponge. I really love to try to grab this knowledge that these artists have from their experiences over the years, be that in the studio or writing music or if it’s being on stage, putting on a stage show. I always listen and try to absorb as much info as possible and learn from that. MI: I read somewhere you started playing guitar at the age of 7 after watching Hee Haw with your dad. Are you still a fan of the show? And why? J5: I do still watch the show, because I love to play guitar and watch tv. I put it on, it’s comforting. I find it comforting to watch something I used to watch as a child.It’s like reliving my childhood because I have a fondness for things like that. Happy times in my childhood and that is definitely one of them. MI: What was it like to have parents supportive enough to accompany you to bars in order for you to play evenings? J5: I think my parents knew that I didn’t do drugs and as long as I got up for school the next day it was ok for me to play. That was the deal, which is a smart deal. Sometimes you get home at 2am and if you got up the next morning, you could do it. There were days I staggered into school with makeup all over my face and the last thing I wanted to learn was history. MI: What do you think you’d of been if you hadn’t of became a musician? J5: Probably dealt in old vintage guitars, opened a store and been an enthusiast of old electric guitars. That’s what I would have done because I have such a fondness for vintage guitars. Maybe later in life I will do that anyway.. a cool guitar shop of old vintage instruments. MI: What do you like to do when you are not making music? J5: I like to do is go to the movies and hanging out with family and friends. It’s a tough question because I like playing music so much. Hanging out with family & friends.